By Sahra El Fassi. On May 25 this year, the African Union celebrates its golden jubilee anniversary in Addis Ababa. The event will be marked by numerous milestones, and is under the theme of Pan Africanism and African Renaissance. Beyond the confetti, however, there is a desire for the next 50 years to be sung to a better tune: one that is based on improved socio-economic opportunities, peace and political stability on the continent. One that builds upon constructive and strategic partnerships with old partners and newcomers that match the interests and the needs of the continent. The African Union is by no means new, but in recent months Africa has experienced many firsts. For the first time, a lady has been appointed as the chairperson of the African Union Commission. Also, for the first time since she was appointed in October 2012, Mrs. Nkosazana Dlamini Zuma met with her European counterparts in Brussels in order to discuss the need to improve EU-African relations and particularly the effectiveness of the Joint Africa EU Strategy (JAES). For the first time the BRICS Summit was hosted on the African continent; and for the first time its agenda was that closely related to African countries’ development. 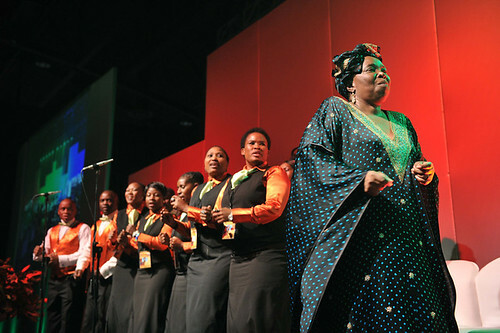 As emerging nations have become increasingly interested in African countries, the African Union was invited to take part in the 2013 BRICS Summit in Durban, South Africa. Both, the invitation as such and the choice of the summit’s topic, mark an important stepping-stone for the pan-African institution. The agenda under the banner 'BRICS and Africa – Partnership for Development, Integration and Industrialisation' was touted as a success by participating nations and included a BRICS leaders Africa dialogue forum. Surrounding the theme of unlocking Africa's potential, the overall objective of the forum was to offer an opportunity for BRICS and African Leaders to engage in measures to strengthen cooperation. It may also have proven that the continent is taken seriously as an economic and political partner. The Chinese president for example strongly expressed this political will to realize common development. Reaffirming that “the 21st century would surely be a century of rising for Africa”, Xi Jinping made a landmark political move by highlighting ‘the central role of Africa to the world’s international affairs’. These statements certainly echo the African Union’s resolution to meet its objectives: to have a say within the global agenda and to live up to their vision of an integrated, prosperous and peaceful Africa. The rebalancing geopolitics, not unique to the presence of China alone, is a key element that also affects the relationship between Europe and Africa. It brings about many fears and questions. As much as Africa wonders to what extend it really matters for Europe, European partners have concerns on how important they will be in Africa as new players enter the arena. An agenda fit for the future of a strategic AU-EU partnership? When it comes to Africa’s relations with the rest of the world, terms such as ‘strategic partnership’, ‘shared vision’ or ‘win-win cooperation’ are increasingly persistent. At a time when African nations long for the recognition of their capabilities and their leaders stress “times of boundless opportunities for Africa” the discourse of external actors has begun to go beyond ‘aid’ or ‘foreign assistance’. On April 25-26, the 6th African and European Union Commissions encounter (also known as College-to-College or C2C Meeting) took place in Addis Ababa. Both colleges agreed to deepen cooperation in a wide range of issues such as peace and security, which seems increasingly predominant in Africa-EU relations. Collaboration is also envisaged in employment, migration, human rights, sustainable agriculture, trade facilitation, climate change, science and technology and fiscal matters. This would overcome the long-held focus on development and could make the partnership more modern and timely. In the run-up to the 2014 Africa-EU Summit, discussions did include a reflection on Africa-EU relations and a more efficient implementation of the JAES. In an Op-Ed entitled ‘Two Continents, one Vision’ AU chairperson Dlamini Zuma and European Commission President Barroso not only highlight the closely intertwined future of both continents and suggest expanded collaboration. They also argue that sustainable and inclusive growth requires the full involvement of civil society, the private sector and social partners. In that light it was agreed upon a joint brainstorming session with relevant stakeholders in June 2013. Let’s hope the outcomes of this joint session will be able to help unveil the key priorities of both sides, further lift the lid on what is unique and fertile about the two continent’s joint vision and partnership and result in strategic directions on how to enhance common interests and shared values. Instead of looking for new actors interested in Africa as rivals and judging their behavioral patterns, the time has certainly come to focus on caring about how to meet interests and objectives of the EU-Africa relationship. How do joint declarations and policy recommendations effectively translate into practice? To give some examples, how can cooperation in mineral resources management further focus on good governance and transparency? How will cultural exchanges allow to better involve citizens in the implementation of the JAES? Or how does reaffirming the joint commitment to promote and protect human rights translate? The success of the EU-Africa relationship does not solely depend on the coherence of policy frameworks. Both sides will have to be honest and frank about their expectations and recognize that their interests go beyond mere development cooperation. The Joint declaration of the 6th College-to-College meeting recognizes that while the two Commissions’ political and operational impetus remains instrumental, other stakeholders' efforts are vital to make the Africa-EU partnership a success. When the various stakeholders find common ground on a manner that acknowledges the interests and opportunities of the relations between Africa and Europe, would that partnership not be likely to become one of equals? Isn’t this exactly what both Europe and Africa should bear in mind when pursuing a strategic partnership? A real narrative of opportunity and potential.